Provide comfort for the family of Nettie Wright with a meaningful gesture of sympathy. 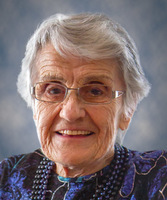 It is with deep sadness that our family announces the peaceful passing of our mother, grandmother and great grandmother, at home on her terms, on Wednesday, February 6, 2019 at the age of 93 years. Nettie will be lovingly remembered and dearly missed by her children, David (Margie McLeod) Wright, Dianne Paulson and Donald (Helen Browne) Wright; grandchildren, James (Katie) Wright, Geoffrey (Brianna Baxter) Wright, Jen (Colby) Wrobel , Sandra (Jeffery) Symbaluk and Krista (Michael) Gulseth; great-grandchildren, Grace, Thomas and Evan Wright, Callum and Isla Wright, Eva and Easton Wrobel, Julianna, Kimberley and Jayson Symbaluk, and Alexandra and Olivia Gulseth; sister, Sandi (Casey) Skakun; sisters-in-law, Bess Kostynuk and Merie Wright; and brother-in-law, Wally (Carol) Wright. Predeceased by her husband, James in 1990; siblings, Olga, Bob, Spence and Lucy; sister-in-law, Jo-Anne; son-in-law, Larry Paulson; and sisters and brothers-in-law, Betty, Bob (Jane) and Jack. Celebration of Life Wednesday, February 13 at 3:30 p.m. at Canterbury Court Chapel, 8403 – 142 Street, Edmonton. In lieu of flowers, donations may be made to the Canadian Diabetes Association, Suite 104, 12220 Stony Plain Road, Edmonton, AB, T5N 3Y4 or the Heart & Stroke Foundation of Alberta, NWT & Nunavut, Suite 144, 5241 Calgary Trail NW, Edmonton, AB, T6H 5G8.